On Saturday, September 15, 2018, one million Jakartans took to the streets in the early morning sun to pick up litter and clean up the capital together in the sixth annual ‘Clean Up Jakarta Day’. The aim of the annual city-wide clean up event is to educate people about the detrimental effects of littering, while grooming responsible and environmentally-concerned citizens. Born in 2013, Clean Up Jakarta Day has grown from strength to strength, and this year the event received official recognition from Pemprov DKI Jakarta. The Governor’s office released an instruction letter to the heads of Jakarta’s sub-districts to conduct clean-ups on 15 September (Instruksi Sekretaris Daerah Provinsi DKI Jakarta Nomor 76 Tahun 2018 Tentang Pelaksanaan Clean Up Jakarta Day). Because of this support from the government, the total volunteer turnout for the whole of Jakarta was a colossal one million. Figures from Dinas Lingkungan Hidup who weighed and collected all the recyclable and non-recyclable waste from each site, reveal that a total of 102.02 tonnes was collected from all clean up locations in Jakarta and the Thousand Islands. Kampung Kesepatan in Cilincing, North Jakarta, a location joined by just 150 volunteers, was able to collect nearly 2 tonnes (1,983.30 kg) of garbage in the space of just two hours alone. Gelora Bung Karno Stadium was cleaned by a group of nearly 1,000 volunteers and collected a total of 1,250 kg) much of which was leftover litter from the recent Asian Games. The location with the third most waste collected was Pantai Ancol Timur, who gathered 638.2 kg of waste from off the beach. Usually taking place in October, this year Clean Up Jakarta Day moved its clean-up earlier to 15 September to coincide with the very first World Cleanup Day. Reports on the numbers of volunteers indicate an estimated count of 13 million people from 144 countries, who came together in an attempt to raise awareness to the growing global problem of garbage. Indonesia led the way on World Cleanup Day, as the nation with the highest contributor of volunteers. The most recent figures show a turnout of 5.6 million in 34 provinces in Indonesia. Pakistan and USA followed with 3 and 1.5 million people respectively. “We are thrilled to have taken part on World Cleanup Day and are so proud of Indonesia for having the largest turnout of volunteers in the entire world!” says Angela Richardson, Founder and Chief Coordinator of Clean Up Jakarta Day. “Today we have shown that Indonesia cares about its waste problem, and that there is hope for change,” she added. Dozens of schools and universities came together to clean up on Saturday. Through Dinas Pendidikan DKI Jakarta (Jakarta’s Ministry of Education), 50 national schools with 10,000 of their students cleaned up the streets around their respective campuses. Private schools that joined included Gandhi Memorial School, Mentari School, Australian Independent School, and ACG School. Many businesses have Clean Up Jakarta day set on their annual corporate social responsibility (CSR) calendars. This year, companies including PT Adaro Energy and Glencore Indonesia ran their own successful clean-ups in central Jakarta. Clean Up Jakarta Day was also joined by several Ambassadors to Indonesia. Swedish Ambassador-designate Marina Berg, Norwegian Ambassador Vegard Kaale, and Finnish Ambassador-designate Jari Sinkari lent their hands at Jl. Dr. Prof Satrio in South Jakarta. For the very first time, Clean Up Jakarta Day 2018 welcomed, with open arms, clean-up sites run by refugees living in Jakarta. HELP for Refugees, a refugee-led education centre in Tebet, South Jakarta, had a team of 50 volunteers who cleaned up on Jl. Tebet Timur Dalam, and Roshan Education Center showed they care about Jakarta by cleaning up at Jl. Tanah Baru I in Kebayoran Lama. 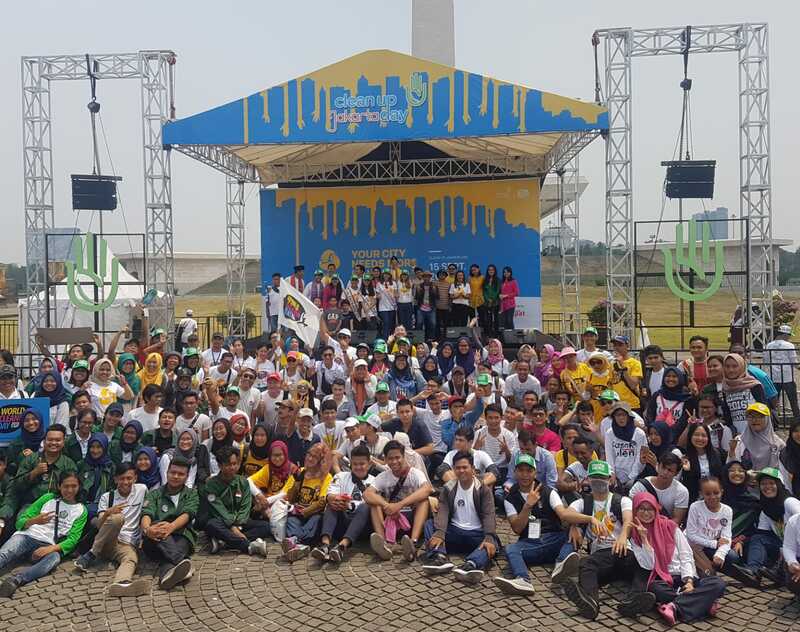 After the cleaning up activities, Clean Up Jakarta Day hosted a Closing Ceremony at the national monument of Monas for approximately 1,200 volunteers, who participated in the cleaning up earlier that same morning. Here, volunteers were entertained by ambassadors from the folk band Bangkutaman and pop star Oppie Andaresta dan Suara Anak Bumi, with inspirational songs about caring for the Earth. Clean Up Jakarta Day was made possible by ACG School Jakarta, an independent co-educational international school in South Jakarta established in 2004 for children from three to 17 years of age. Clean Up Jakarta Day is sponsored by Risco Energy, PT Adaro Energy, PT Chandra Asri Petrochemical, and Coca Cola Amatil Indonesia. Clean Up Jakarta Day is brought to you by Indonesia Expat, a free English language publication in circulation since 2009. For more information, please email [email protected] or contact Angela (Founder & Chief Coordinator of Clean Up Jakarta Day) via WhatsApp on +62 8128387458.